The World is loud right now. The World is afraid. The World is suspicious. The World is sad. The World is angry. How do you feel? Can we pray for the World and for our hearts for God's peace? Flaws- Kierra Sheard- Johnny and Lindsey on Chorus "My flaws"
I think the closest I have ever come to “dying” is when I had Tre. I had to have a surgery after ward and had to have anesthesia. I signed the form and was pretty nervous about this procedure. The last thing I remember saying to the doctor was please don’t let me die. And no she didn’t say of course not, she have a nervous laugh and said lets not think like that. The last thing I saw was this pink and black designer tile coming down and the from two directions closed in over my face like a tomb scrapping sounds and all….! I don’t think I will ever forget that feeling or those sounds. But I truly felt dead. It wasn’t a good feeling . I felt alone, permanently placed and trapped.Have you ever felt that way? You don’t have to be physically dead to feel cut off from life. Sometimes in our lives we feel all these things and they probably don’t feel any better than being dead. And we kind of wait for a rescue. Amongst many things we wait because death in any sense if not permanent. But who are you trusting to call you out? Let me just say Jesus is not always my first thought. I think at times I rely on myself to get the job done. In my mind I feel like this may be one of the reasons for us not to see Jesus in all his glory and believe that he can rescue us. We feel, deep down in the back of the brain where we keep our own laws for life, that we can do what Jesus can do. That we can do as well of a job as he can or that we can only trust ourselves to care for us the way we need to be cared for. All of this is not true of course. WE see this in the story of Lazarus. Jesus could do way more than Lazarus could. Lazarus was dead. If it were up to Lazarus he would have stayed dead. Jesus wouldn’t let him stay that way. He loved him so much, he wept and he called him out of his state. A Savior like that is worth trusting. Doesn’t mean we wont doubt. We’ve been hurt, shunned, done wrong, lied to and a whole manner of things that make up our lives. It’s not always easy to see the beauty of God that requires that you believe and love him. In our own humanness we cant understand something for nothing. A saving, the ultimate favor….love quite frankly. Here are the songs for the week. Let’s let them help us to pray and talk to God about what’s holding us in the grave and maybe any doubt we experience. He will answer. Have a good week, see you Sunday! I grew up on Tisdel Road, named after my family, made of black pavement. My house was at the end of a long gravel driveway set off from the street. Below is an update straight from Shannon and Charity about their work yesterday at the camp. 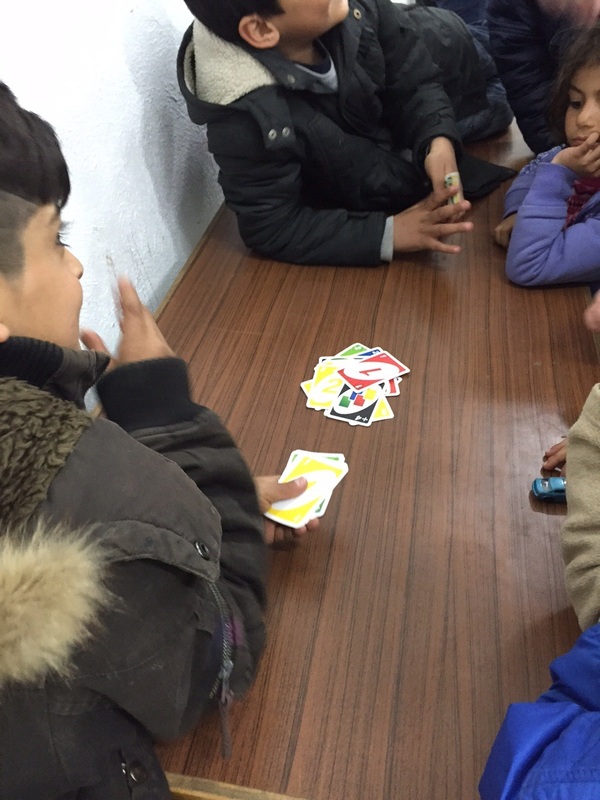 "The past 2 days we have been helping the army make new registration cards for everyone in the camp. Everyone needs to present a card to get meals, water and other supplies. The army keeps paper records by hands, so we've written out hundreds of cards by hand these past 2 days. It's a slow and imperfect process, but we get to meet lots of people doing it and provide a useful service to them. Today, I ate lunch with the Syrian family we met earlier in the week. One of the women shared the meal she got from the army with me. Eric says that we cannot out give the people living here and that is definitely true. Another man I met today named Ahmed overheard a member of our team say she was cold and asked if she would like him to go grab his spare coat for her. At lunch, Diala, the woman who was a teacher back home in Syria showed me pictures of her house in Syria and her and her friends out celebrating her birthday when they were all still in Syria. Her sister is 10 and has missed almost a year of school. Most kids have missed more because it was too dangerous for them to go to school in Syria and there is now no access to education in the refugee camps. Charity met a group of women and sat with them in their tent today and they opened up and shared their stories. The tent had only 3 beds, but is "home" to 2 mamas and 5 kids. 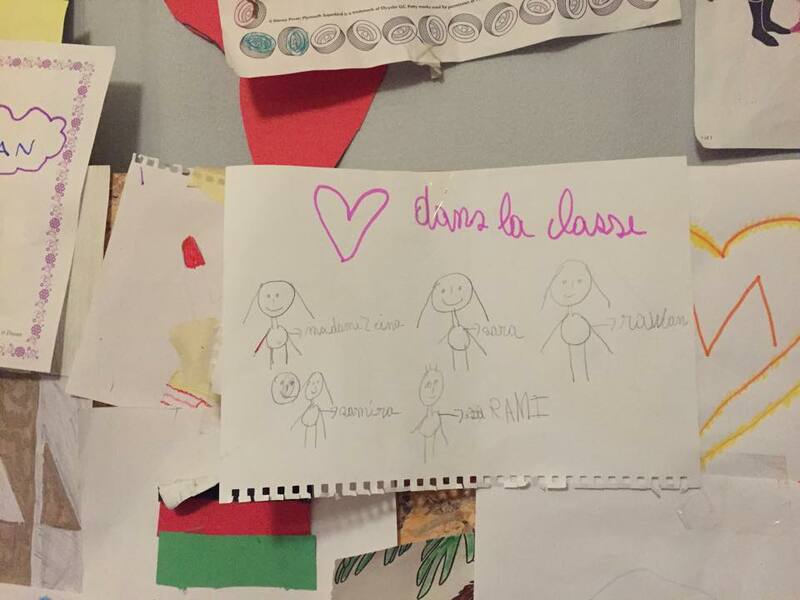 These women are raising the kids alone as their husbands have already gone on to Germany." Day 1: "Children run up and play with us everywhere we go." "A family of 18 from Syria invited us to hang out with them and learn their stories. One of them is 26 years old and teaches first grade." "This camp of over 2,300 refugees is run by only 10-15 Greek soldiers." "I am hurting for a new friend who is having a difficult time because, 'This place is just not my home.'" "It is clear that these conditions are not permanent or ideal for this many people. However, they are not hopeless. They treat other with respect and dignity." 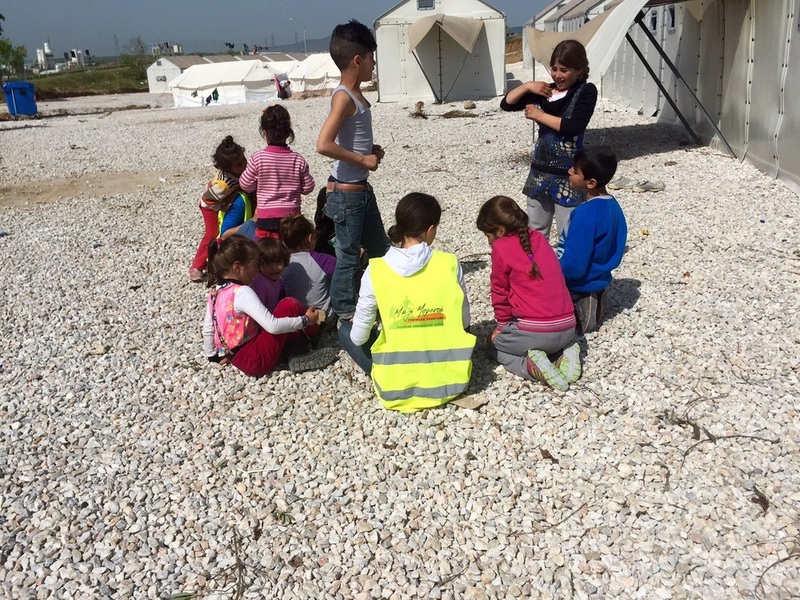 A new camp has been setup in Diavata, Greece just 20 minutes from Thessaloniki. 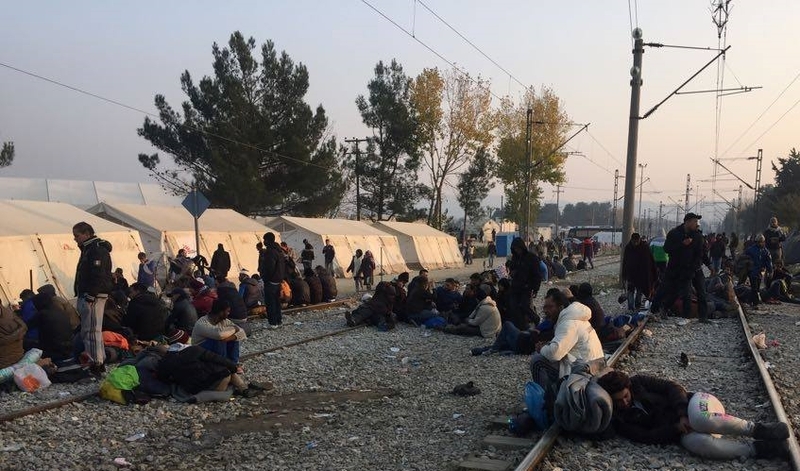 Two of Connection Church's own, Shannon Smith and Charity Cast, have taken the long journey to serve refugees living in a temporary camp near the Macedonian border in Greece. The quotes above are a few of their experiences from their first day of service at the camp. We will continue to provide more stories as they come to us. Smoke rises as it blends into the orange, pink and grey clouds above, backlit by the setting sun. This is the final sunset for Kari McGhee, Lindsey Mayberry and Karen Davis here at a refugee camp in Idomeni, Greece along the Southern border of Macedonia. Thousands of people who have been forced from their homes because of terrorism, civil war, pressure to join extremist organizations or overwhelming economic depression do not know when they will see their final sunset. "Where should we go? Should we wait? Do you have any extra tents?" "There are two little trees the refugees walk through in order to cross from Greece into Macedonia," Kari said. "As they turn north to head across the railroad tracks there are usually tears in their eyes as they cross from one obstacle in their journey to another." Some families were finally allowed to cross today but many others are beginning to be all too familiar with their surroundings. Kari told me, "Those who cannot currently cross the border have been here for 4 or 5 days. With the cold temperatures and lack of supplies and food, they have not eaten or slept well at all." The most frustrating thing for the volunteers is the lack of answers. They give bad news all day as people continue to ask, "Where should we go? Should we wait? Do you have any extra tents?" "These people are forever etched in my heart"
Karen Davis said she will never forget her new friends, all from countries she had never spent much time thinking about. "The people I had heard about on the news for so long but had never given a second thought about are now my friends. Friends from Syria, Iran, Iraq and Afghanistan. These people are forever etched in my heart and mind and I will pray daily for them as they seek better lives for themselves and their loved ones." Kari said, "Everyone here just asks that we share their stories. They are mothers and daughters, fathers and sons." They had normal lives in cities like ours until they were overrun with extremists and violence. "They want people in America and Europe to know that they are not terrorists." Karen met a young man who had been imprisoned and beaten because he began attending a Christian church in Iran. "As a high school graduate he was expected to join the military. He wanted to study at the university instead so he is trying to join his mother who has found asylum in Germany," Karen said. "He felt there was no way he could join Iran's military because he was not ready to die, he had no other choice but to flee. He later told me, 'now I am free to worship God.'" Karen was able to pray with him and encourage he and his family and friends to remain clam even though they were cold and frustrated after having waited five days at the camp. The women said their goodbyes tonight to their new friends but this will not be the last time they think of them. They have been forever changed by their experience and they have certainly made a lasting impact on many of the refugees' lives as well. As the boarder remains closed to anyone except those seeking asylum from Syria, Iraq and Afghanistan, the population of the camp continues to swell. Kari McGhee sits in one of the main tents coloring with children. Refugees gather around midday for a concert. Lindsey Mayberry recalled, "It was beautiful. The joy, sitting on railroad tracks, being unified by the beauty of the music. It affected me so much. We all sang an American Pop song together; Iranians, Persians, Lebanese, Iraqis, Moroccans, Americans, Syrians and Afghans." Men gather around a fire burning any scraps that could be found. Tonight a pregnant woman and her husband fell asleep alongside friends and family under the stars in Idomeni, Greece. They are not camping, per se; in fact, they do not even have a tent so the crisp night air brushes over them as they finally fade into sleep. By any normal standards their present reality is somewhat of a nightmare. It is hard to believe that this is better than what they left behind in Syria, but it is. The sounds of children crying and people stoking small fires with clothes, scraps and small twigs is more soothing than those of the warplanes and explosions they are used to. "As soon as I saw their faces I began to weep." 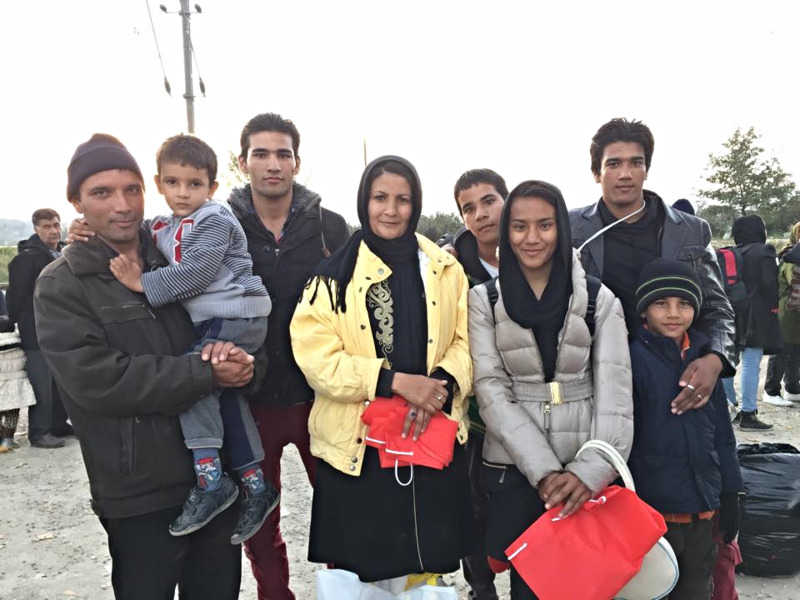 "I was approached by a man who spoke enough English to introduce himself and his friend to me and ask if I had any tents left for them and his pregnant wife to sleep in," said Karen Davis, a missionary volunteer serving the refugees for the week. "I told him I'd try my best to find one but when I couldn't I came back and gave him the same answer I had been giving so many today regarding food, water and blankets. 'No more.' As soon as I saw their faces I began to weep." Karen Davis and Kari McGhee rest at sunset. 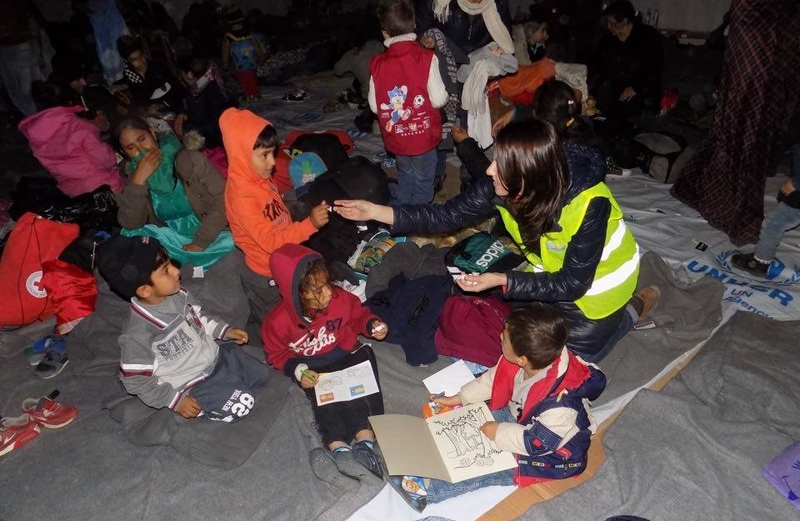 They worked past midnight trying to comfort families as they tried to find warmth for the night. Karen and the other volunteers learned before arriving at the camp today that the Macedonian border on which their camp was situated would be closed today as officials attempted to figure out what to do with the influx in refugees, especially those coming from war-ravaged nations like Syria, Iraq and Afghanistan. Karen said, "We had been passing out blankets, water, snacks and some random bags of food and water but as the busses kept coming, suddenly all we had was bad news. 'No, we don't have water. No, we don't have food. No, there aren't any blankets left.'" This news was bad enough but the lack of tents really hurt. 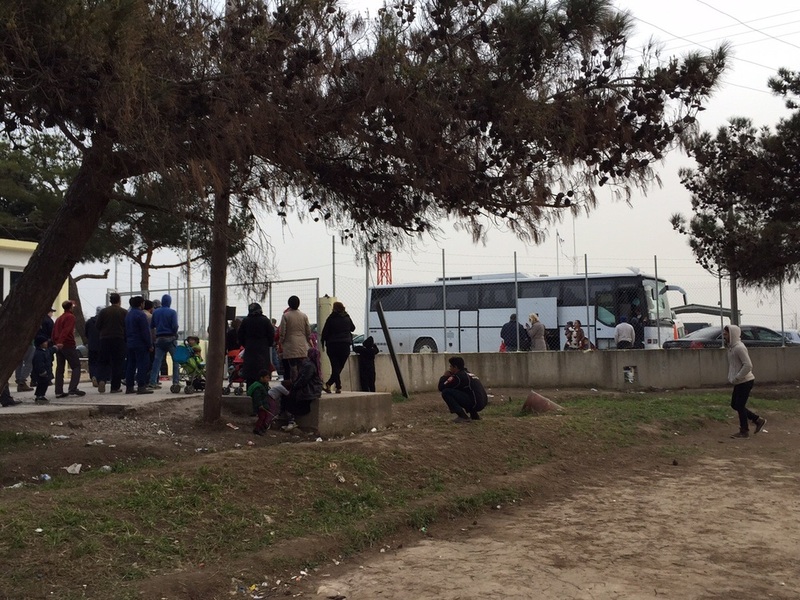 The weather in Idomeni is cold this time of year, with lows dipping into the low 40s. "As the tears streamed down my face, the man I had just delivered the bad news about the tent to, I don't even know his name, put his hand on my face and wiped my tears and said, 'Don't cry ma'am, it will be okay.' I prayed with them right there in the darkness and asked God to protect them and bring them safely to their destination. They were so excited to hear me pray and thanked me repeatedly. They smiled, hugged me, said goodbye and walked out into the darkness. While I came here to encourage them, I found encouragement and compassion in their eyes. I will never forget them, these two strangers." Two more tents were constructed to house the swelling population as borders remain closed. "I was sitting on the floor talking to people when the lights went out." "As terrible as the situation is; families with young children sleeping outside in small tents or in the fields on empty stomachs, the people remain peaceful and calm. They are so appreciative it's unreal. We had so many great conversations, learning their stories and hearing about their lives at home and journey thus far," said Kari McGhee, another member of the missionary team. Not everyone who attempts to flee to Europe makes it this far. Lindsey Mayberry, the third member of the team, met two 19-year-old men who made it as they watched others fall short. 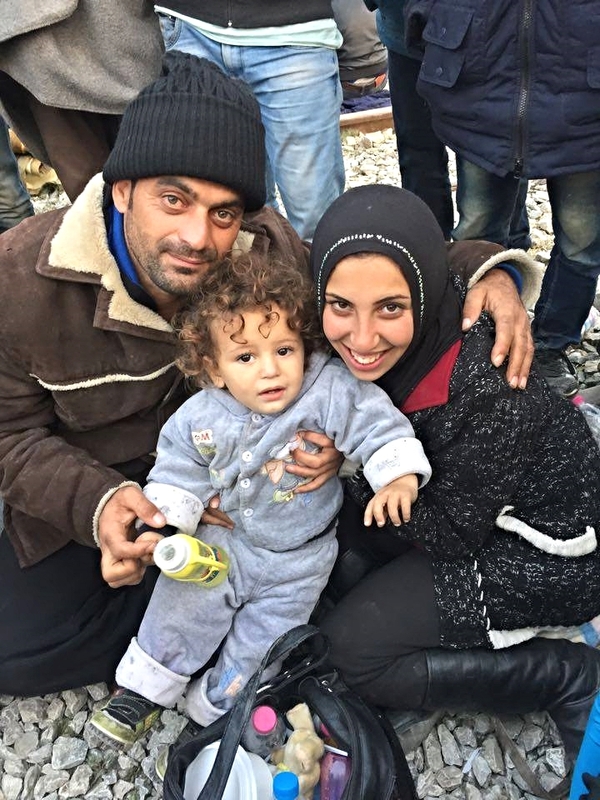 Adnan (pictured above) decided to leave his home in Damascus, Syria one week ago. They made it to Turkey and boarded a raft, as most do, in the Aegean Sea bound for Greece. "He showed me a video he took on his phone in the raft as Turkish police screamed for them to come back. They were able to pull away but the raft directly behind them was apprehended by officials who arrested everyone on board," Lindsey said. Adnan, who was gentle, soft spoken and very good at English left Damascus with hopes to study electronic music in Germany. Lindsey told me, "When his father heard he was leaving he decided to go with him and try to travel on to Sweden where he may be able to get a job and afford to bring his wife, Adnan's mom, and two daughters (ages 12 and 9) over to Europe as well." Adnan and his family were directly affected by the civil war that has ravaged Syria for the last four years when his older brother decided to help suffering people alongside the Red Cross and was captured by the Syrian government. They have not seen or heard from him since. He asked if I could adopt him and take him back to America with me. Anas is an Iraqi refugee and is also 19. He hung out with Lindsey all night, nicknaming her "Rose," and giving his blankets away to mothers and children around the campsite. Lindsey said, "He was so compassionate. I showed him pictures of my three boys and told him all about my family. He asked if I could adopt him and take him back to America with me. I also heard stories from other young men; one who said the smuggler who helped him and his friend secure spots on a raft put a gun to his friend's head and told everyone on the boat not to come back. He shot his friend in the head and he fell into the water as they pushed out from the shore." LORD, you are the defender of the helpless, a strength to the needy in distress, a refuge from the storm, a blanket in the cold. The ruthless have rained on these people like a mighty storm over the ocean but just as you have calmed the seas by the hand of Jesus, subdue and bring justice to the armies, rebel groups, governments and authorities who have oppressed and murdered these people. Silence the song of the unjust. Prepare a lavish banquet for these people; a banquet of aged wine, choice meat and all that is good. You are their God for whom they have waited that you might save them. This is the LORD for whom they have waited; Let us rejoice and be glad in His salvation. Compassion is built when you look into another person's eyes, listen to what they are saying and care for them. Listening and caring are difficult when the person is not in front of you and that is one reason it is so hard to have genuine compassion for the refugees you are hearing about on the news. Take a moment to look into their eyes, listen to their stories and care. As you do, you may find the compassion that has eluded you thus far. 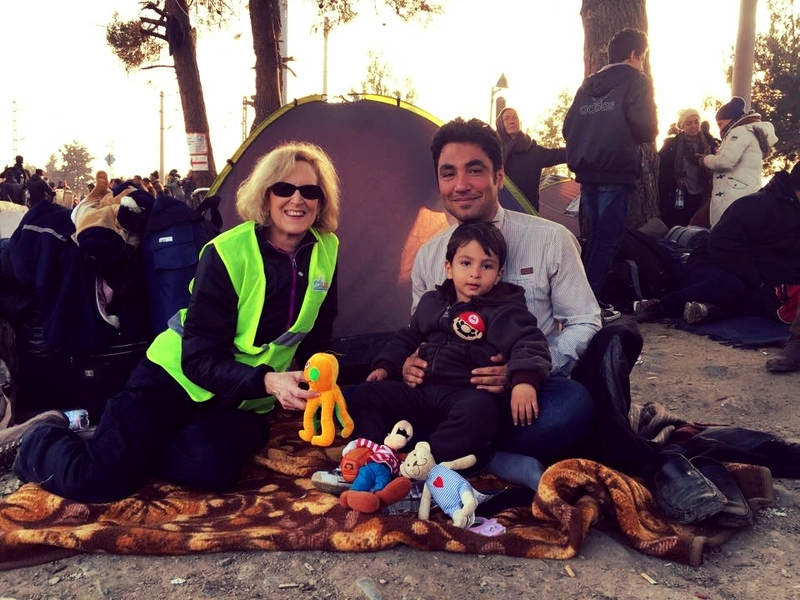 Three women representing Connection Church in Astoria, Queens traveled to Thessaloniki, Greece to serve refugees at a camp in Idomeni, a small village situated at the Southern border of Macedonia. After a relatively smooth journey of over 5,000 miles across a vast ocean, Karen Davis, Kari McGhee and Lindsey Mayberry encountered hundreds of people today who are in the middle of a trying expedition. These refugees have been forced from their homes and communities and are traveling across deserts and seas in search of a place to sleep without gunfire ringing outside their windows. Upon arrival at this camp they wait in long lines to receive supplies such as food and clothing for the remainder of their journey. "They were shooting us in the streets and nobody cared." Two families they met today have already journeyed over 3,000 miles from war-torn Afghanistan over the past two weeks. Although their journey to Germany in search of asylum is three-quarters of the way complete, there is plenty of difficulty ahead. 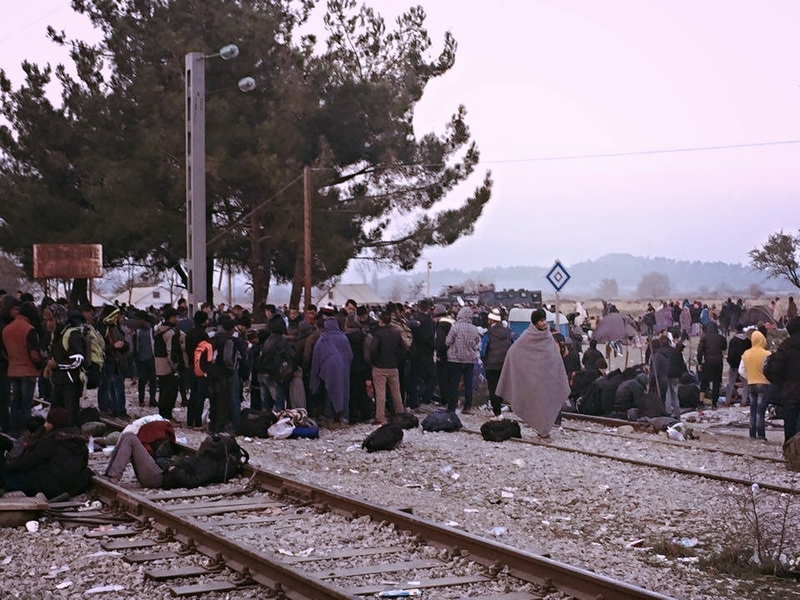 While the team from NYC was at the camp today, Macedonian officials announced that the border is now closed to all people from Northern Africa, including Moroccans, Latvians and Egyptians. The families, who are part of a group of about 50 traveling together, crossed the border into Macedonia today where they will rest for a short time before catching a train to Serbia and continue on toward Germany. When asked why they left one said, "They were shooting us in the streets and nobody cared." These families are running for their lives, leaving their wounded and dead friends, family members and fellow Afghans behind. Kari McGhee recalled, "The people are very peaceful. They are traveling together as family and friends and are warm and loving toward each other and thankful to us for serving." Many families are making this journey with small children and, while spotting a mom on the sidewalk with an infant in a baby carrier is commonplace on a short walk to the grocery store here at home, most refugee moms and dads are holding small children and babies in their arms for the thousands of miles of this journey. Despite the trials and pains, many people were smiling and the children were desperate for some play time. Lindsey Mayberry only speaks English but "play" is a universal language. She has three young boys at home so she knew just what to do. "Today I spent so much time picking up rocks, holding them in my clinched hand and having the children guess which one it was in. At one point a crowd of adults gathered, laughing at the children trying to figure out how I was being so sneaky," she said. "Pray for their continued joyful spirits, they have so far to go." The third member of the team, Karen Davis, noticed how open the English speakers were to sharing their stories. "They tell us the how terrifying the boat ride to Greece was and how thankful they are to be back on dry land," she said. The camp is boring, with not much to do except wait in lines that progress ever so slowly, providing some hope with each step forward. From 5,000 miles away it may be too easy to act like all people are created in the image of God, and like Dietrich Bonhoeffer, a pastor, spy and martyr who fought against the injustices of the Third Reich said, are entitled to the same grace we have been given. This "entitlement" is not based on our merit, but on Christ's. Jesus Christ loves all people, regardless of their response to his message. He also commands anyone who claims to be his follower to do the same. Sometimes that is especially hard when we do not understand what they are saying. If only we could all look them in the eyes.